This is my easy, go to recipe for mac and cheese. I like to prepare mine on the stovetop. I make an easy roux based cheese sauce and add whatever shredded cheese I have on hand. My favorite is to do sharp cheddar cheese, but I have also done mac and cheese with every variety of cheese that comes shredded in a bag. I also vary the type of spices I use in the mac and cheese, depending on the food I am preparing it with and the type of cheese I am using. My son as well as my husband love this classic comfort food, and I prepare it about once a week. I have also used elbow pasta, as well as the rotini and penne pasta. I topped this mac and cheese with fresh tomatoes from my patio. I bought a Burpee hybrid tomato plant for a patio container. The plant and tomatoes are beautiful, but the taste of the tomato was disappointing. It was surprisingly bland and unexciting. Next year I’ll just plant a beefsteak tomato plant in a larger pot with a cage. Cook pasta according to package directions. Melt butter in skillet. Add onion, garlic and seasonings. Add flour and whisk to combine. Cook the roux until it smells nutty. Add milk and whisk to combine. Turn heat to high and bring to a boil while stirring constantly. When mixture starts to bubble and thickens, turn heat to low. Add cheese and whisk until it has melted. Add macaroni back to pot and simmer for about 2 minutes. I adore macaroni and cheese. One of my childhood favorites, and your recipe looks so simple and delicious. Thank you for sharing! This is a simple and super delicious sounding recipe, Angie. I’m going to make it next time I have real cheese in the house (smile). By the way, I always top maccaroni and cheese with tomatoes too-so good it is. 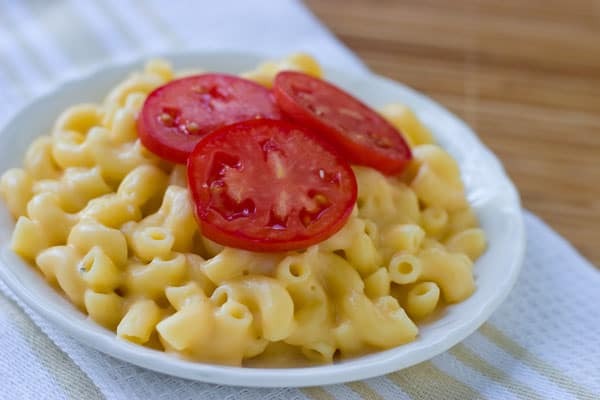 Good ole mac n cheese, a kid friendly favorite! I’m going to try adding mustard, that’s a new one for me Angie. See I just proved that you can teach some old dogs new tricks! Such a comfort food! And your reciepe sounds pretty easy to make. I bet my kids will eat this up if I don’t eat it all first! Thanks! I do the same thing! I really don’t care for dried out baked mac and cheese, I prefer my stove top method, which is very similar to yours. Love the onion and garlic addition you have! This recipe is very similar to my go-to mac and cheese except that I usually top it with some breadcrumbs and put it in the oven for 10 minutes. I also like experimenting with different cheeses. I will have to try this on my family. They are only familiar with “Kraft” mac n cheese and they don’t really like it, but I know this will be a hit. Thanks! What a simple, yet flavorful-looking recipe!! I should start making this more often. That sounds incredibly easy yet really delicious. I’m a sucker for good mac and cheese, particularly as it’s a bit dismal here in Thailand (Thai cheese tastes like plastic!(. Definitely one of our favorite meals… my boys like it to be baked for awhile so the top gets “done” and there is a bit of crunch to it. I prefer the creamy mac& cheese – like yours! Yum! Just about all of whatever you articulate is astonishingly legitimate and that makes me ponder the reason why I hadn’t looked at this in this light before. This piece truly did turn the light on for me personally as far as this subject matter goes. However at this time there is actually 1 point I am not really too comfortable with and whilst I make an effort to reconcile that with the main idea of your point, permit me see what all the rest of the readers have to say.Well done. You’re so interesting! I don’t suppose I’ve truly read through a single thing like this before. So wonderful to discover somebody with a few genuine thoughts on this issue. Really.. thanks for starting this up. This web site is one thing that’s needed on the web, someone with a bit of originality!